Landscape ecology deals with the investigation of ecological relationships in their spatial manifestations. It considers the changes in biological, physical and social components. The study course Landscape Ecology and Nature Conservation is locally restricted, in the past with a Numerus Clausus of about 2.3. Attention! A 3-month internship is required for this course of studies. Landscape Ecology and Nature Conservation is a Bachelor's/Master's programme. In the Bachelor's programme, which has a standard duration of 6 semesters, the student learns the basics of ecology, economics, biology, botany, zoology, landscape studies, geology, geography and necessary legal basics. During the semester breaks internships and excursions are completed. Recently a regular 4 semester Master's programme has been offered, in which the knowledge can be deepened. Landscape ecologists and Nature Conservationists work in protected area administrations or companies with tasks in nature conservation, land use or land use planning. They also find work in environmental policy or in nature conservation-oriented development aid. Are you interested in Landscape Ecology and Nature Conservation? We interviewed Michael, 24, a PhD student at the Institute of Biology. At the time of the interview Michael was in the 2nd semester of the Master's programme Biodiversity and Ecology. Prior to that, he completed his Bachelor's degree in Landscape Ecology and Nature Conservation in six semesters. Are you interested in the unique subject of landscape ecology? 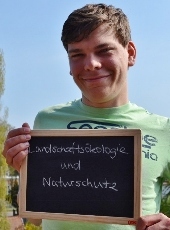 Then simply follow the Link (de) and find out how Michael mastered his studies and what attracted him to Greifswald.